A team of researchers from North Carolina State University have found a way to control a cockroach’s brain, so it might help find disaster survivors. The team strapped a tiny computer which can sense where sound comes from to a cockroach’s back. It “steers” the bug toward the sound because, somewhat eerily, the circuit board is connected to its brain. 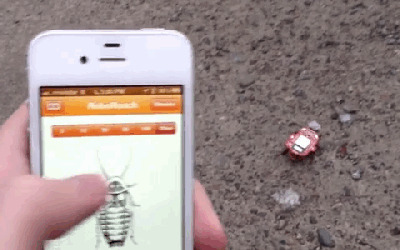 The technology isn’t new – it caused a huge ethical debate last year when a Kickstarter project launched RoboRoach, a DIY kit that saw kids, as young as 10, able to create their own RC cockroaches at home and steer them with iPhones. Kickstarter/GageSwiping the screen of a smartphone controls the RoboRoach’s movement. But there’s unlikely to be little outcry over using the technology for lifesaving purposes, as opposed to fun. There are two types of “biobot”. One carries a single microphone which can pick up hi-res sound and send it on to response teams. The other is where the sorcery kicks in. Biobot two carries three microphones which can actually figure out where the sound is coming from. Then they use sensors to stimulate the cockroach’s brain so it heads toward the sound.